[ Professor Charles de Flandre of Edinburgh University. ] Lithographed Circular in form of a facsimile of an Autograph Letter Signed, requesting subscriptions to his translation of 'Professor Petit's unpublished History of Mary, Queen of Scots'. On his monogrammed letterhead, 15 Dundas Street, Edinburgh. 24 February 1873. 1p., 12mo. Aged and grubby. A convincing facsimile, sent with 'a copy of the title page, the authors preface, a few explanatory remarks and a list of chief subscribers', in the hope that the recipient 'may be induced to become a subscriber' and mention the work 'to any one likely to take an interest in the subject'. No other copy traced. [ John Galsworthy, author of the Forsyte Saga, winner of the Nobel Prize for Literature. ] Printed facsimile of an autograph letter signed, regarding a coming Royal Literary Fund dinner of which he will be chairman. On letterhead of the Royal Literary Fund, Stationers' Hall, Stationers' Hall Court, E.C.4. [ London ] March 1929. 1p., 4to. In fair condition, lightly aged and worn. A circular appeal for donations and a well-printed facsimile. Galsworthy writes that he is taking the chair at 'the 139th Dinner of the Royal Literary Fund, on May 9th: in the Edward VIIth Room of the Hotel Victoria. | The beneficial work of the Fund must be well known to you; nor is it needful for me to stress the urgent nature of the many appeals that tax its resources to the utmost. [ Sir Harold Idris Bell, Keeper of the British Museum Department of Manuscripts. ] Autograph Letter Signed ('H. Idris Bell | Keeper of the MSS.') to an unnamed recipient, giving reasons for considering his 'Franklin letter' a lithographic facsimile. On letterhead of the Department of Manuscripts, British Museum, London, W.C.1. 28 October 1931. 2pp., 12mo. In good condition, lightly aged. Neatly written over twenty lines. The letter begins: 'I feel no doubt that your Franklin letter is a lithographic facsimile. As you say, the paper cannot be the original, & the flat, undifferentiated appearance of the ink is just that of a lithograph, though there is no trace of the edges of the plate, but this is not always found in a lithograph.' He proceeds to provide details of the publication of the letter, suggesting a possible source for the facsimile ('but we have been unable to discover whence it is taken'). [ Edward Mason Wrench, British Army surgeon. ] Cyclostyled facsimile letter (with facsimile signature 'Ed M Wrench') describing a visit to 'Buffalo Bill's Wild West Show', with two illustrations, intended for distribution amongst his family. Baslow [ Derbyshire ]. 24 July 1887. 2pp., 12mo. Printed on one side of a piece of 21 x 26.5 cm paper, with central vertical fold dividing the pages. In good condition, lightly aged. Addressed to 'My dear Children'. He begins by describing his attendance at the laying by Prince Albert Victor of 'the first stone of the New Bancroft Schools at Woodford', with lunch by the Drapers' Company. He soon changes tack: 'On the 14 I visited Buffalo Bills Wild West Show and you will I dare say like to hear what I saw there, better than what we did at Woodford.' He notes that he was 'mightily taken with the reality of the show. [ Printed volume with 234 pages of lithographed facsimiles. ] The Autographic Album. A Collection of Four Hundred and Seventy Fac-Similes of Holograph Writings of Royal, Noble, and Distinguished Men and Women, of various Nations. Lawrence B. Phillips, F.R.A.S. Lithographed by F. G. Netherclift. iv + 37 +  + 234pp., 4to. In grey cloth binding, gilt. All edges gilt. Internally in good condition, lightly aged, in worn binding with rear spine shoulder splitting. The title continues: 'Designed for the use of Librarians, Autograph Collectors, Literary Men, and as a Work of General Interest. With Biographical Notices, and Occasional Translations.' The letterpress consists of a title leaf; and a two-page preface followed by a 'Biographical Index' of 37pp., and a page of errata and addenda. Sammlung historisch-beruehmter Autographen, oder Facsimile's von Handschriften ausgezeichneter Personen alter und neuer Zeit. Erste Serie. [all published] Stuttgart: Ad. Becher's Verlag. 1846. Quarto. Not paginated, but consisting of around 240 leaves containing approximately 280 numbered and well-executed facsimiles. In original brown cloth decorative binding. On aged paper in worn binding, with front board detached with first seven leaves. No letterpress, apart from title and alphabetical index. Apparently published in England under the title 'A Collection of three hundred Autograph Letters of Celebrated Individuals of all Nations, from the sixteenth to the nineteenth century. [...]'. COPAC only lists a copy at Aberdeen. August 1894. William Mackenzie, 69 Ludgate Hill, Edinburgh and Dublin. Clarke is a forgotten Shakespeare editor, there being no reference to him (nor any copy of this item) on the COPAC or the Folger online catalogue. A bankrupt and bigamist (he was 'married' five times), he fathered 33 or 34 children, and worked in the booktrade as a commerical traveller and entrepreneur. 4to, 10 pp. One central horizontal fold. Fair, on lightly-aged paper with a little marking to the outer pages. Date in type at end of list of subscribers, 'AUGUST, 1894. ', followed by a short note by 'A. Folio pamphlet: 8 pp. In brown wraps with 'TO MR. LAW. 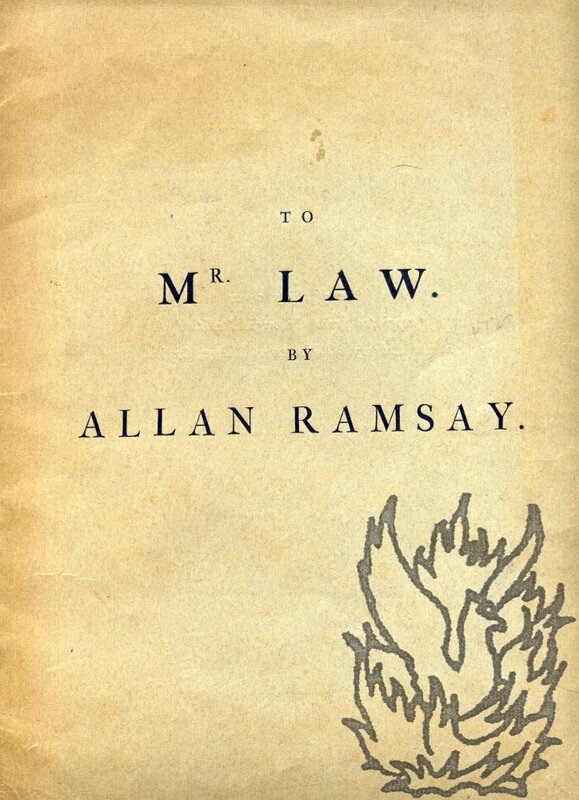 BY ALLAN RAMSAY.' on the front wrap and the publication details on its reverse. On aged and lightly-creased paper, in worn, creased wraps. Nicely printed, with the long s, at the University Press. Originally published anonymously in 1720. 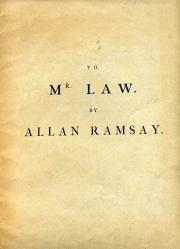 Facsimile of title ('EDINBURGH: Printed for the AUTHOR at the Mercury, opposite to Niddrey's-Wynd, MDCCXX.'). A scarce (unattributed) Oxford University Press item: of the thirty copies COPAC lists four: at the British Library, Oxford, Cambridge and the National Library of Scotland.